Jenny Brosinski, So Now You’ve Got the Best of Me, 2018 (Oil, charcoal and olive oil on canvas, 80 x 60 cm). 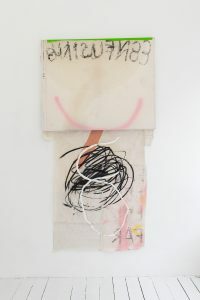 Jenny Brosinski, Put It All Into One Bag, 2018 (Oil, oil stick, charcoal, olive oil, spray— paint, staples and dirt on canvas, 190 x 100 cm). 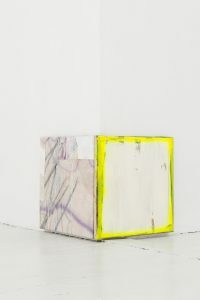 Nevven is proud to present You Made Me the first solo exhibition in Sweden by the Berlin—based artist Jenny Brosinski. 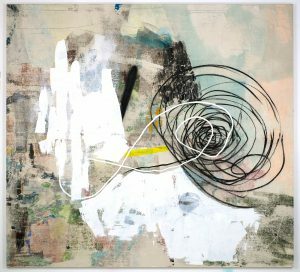 Characterised by a striking gestural abstraction, intermitted by hints of naive figuration, her work deals in a unique way with canvas. 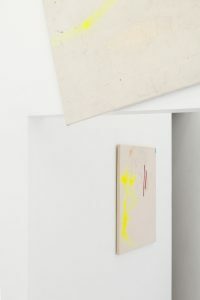 Brosinski paints on raw cotton then tumble dries her paintings causing them to fade and react in a way that escapes her control. 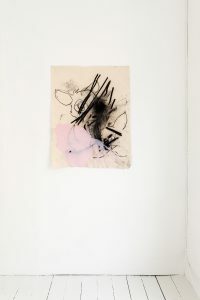 She proceeds then by marking their surfaces with charcoal, oil—sticks, markers, spray—paint or oil in a fast and intuitive process that often leaves stains of dirt, chlorine or coal on the canvas. 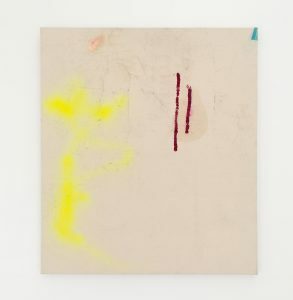 These marks contrast and at the same time blend into the overworked yet almost vanishing surface of her works, still bearing all the energy of an immediate, instinctive gesture. 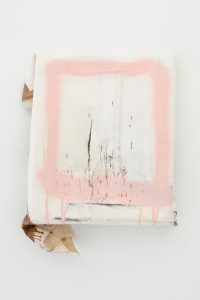 Jenny Brosinski is an educated painter, she masters her technique and her media, yet in her process she does everything possible to erase her advantage and surprise herself by responding to the unexpected. 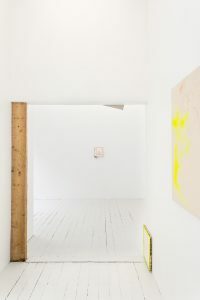 Her paintings, in the faded and stained surface of the canvas, carry all the traces of this process. The moments of action and release, the phases of addition and then erasure, the instinctive gestures and the thoughtful layering are all contained in the contrast between the washed—away colours and the bright and strong tones which characterise the final interventions. 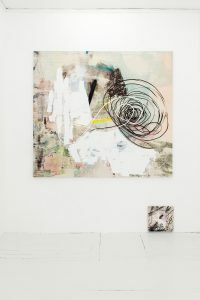 Brosinski completes her works with ironic and intimately narrative titles whose day—to—day nature recalls the captions of social—medias’ posts and expands the significance of her often abstract paintings. 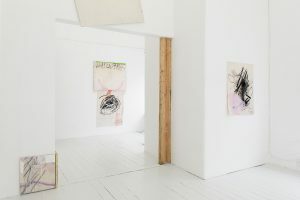 The selection of new works on canvas presented in You Made Me describes Jenny Brosinski’s practice in what the German artist considers as a moment of culmination after the recent founding years of her career. In You Made Me Brosinski stops to reflect, thankfully, over the importance of all the supporters, social—media followers, art—collectors, galleries, institutions and — why not — the coincidences which made her work recognised. 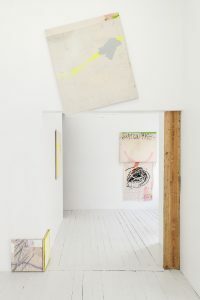 It is in this added significance that she wants us to approach the canvases included in You Made Me, which, ranging from her usual extra—large format to extra—small, and including some new installative solutions, play with and subvert the perception of the spaces they hang within.